Could your thyroid be responsible for fatigue during and post menopause? 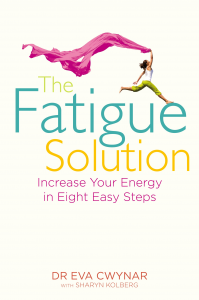 When I was asked if I would like to review ‘The Fatigue Solution’ by Dr Eva Cwynar, I immediately said yes, as fatigue is an issue that many readers have expressed . I would be the first to put up my hand to say that I start most days feeling absolutely exhausted- and rarely 100%, so any book offering constructive advice and exploring the reasons as to why many women suffer from fatigue in midlife was a must for my reading list. I would highly recommend this book, and have been given permission from the publisher to share an abridged extract covering the impact the thryoid has during the menopause, it may well strike a chord! The woman was in her mid-50s. She had an extremely high-pressure job and was in the public eye. Her struggles with weight over the years were well known. Although most people did not know it, she had also struggled for years with symptoms such as anxiety and sleeplessness and even occasional panic attacks. In 2007, her weight gain began to escalate rapidly, and many people noticed she was looking tired all the time. Normally a high-energy type, she was now exhausted. She saw several different doctors; none of them could figure out what was wrong with her—until finally, one of them recommended thyroid testing. “First hyperthyroidism, which sped up my metabolism and left me unable to sleep for days. (Most people lose weight. I didn’t.) Then hypothyroidism, which slowed down my metabolism and made me want to sleep all the time.” The woman’s name is Oprah Winfrey, and until she announced her diagnosis and treatment on her famous talk show, many women in America had never even heard of the thyroid gland or thyroid disease. If you want to see me get excited, start talking about the thyroid. Not a subject many people are passionate about, I know. But for me, this is what gets my blood boiling. Maybe it’s because it’s so misunderstood, so underestimated, and in so many cases, just plain ignored. When was the last time you went to the doctor and he checked your thyroid? You would know if he did, because to manually examine the thyroid, you have to step behind the patient and put your hands around the patient’s neck as if you were going to choke her. That’s the only way you can feel for the butterfly-shaped thyroid gland, which is located at the front of the neck near the collar bone (right where a man would wear a bowtie). When I introduce this examination to my patients, I always get the same reaction: “What are you doing? No doctor has ever done that to me before!” That’s why I say it’s the gland that’s ignored. You can’t breathe without the thyroid, you can’t think without the thyroid, you’d constantly be constipated without the thyroid, and yet it’s way down at the bottom of the list of possible causes of some very common symptoms. Are you losing your hair? It could be your thyroid. Is your voice getting hoarse and raspy? It could be your thyroid. Are you always cold? It could be your thyroid. Are you having trouble concentrating? It could be your thyroid. And if it is, it’s something that is easily fixed. That’s why I get so angry and excited at the same time about the subject. People are suffering needlessly, some for many years, when they could be leading much more energetic, productive lives with the right diagnosis and treatment. Those people who have heard of the thyroid usually believe it has something to do with weight loss and metabolism, and they use it as an excuse for their weight-loss difficulties. “I know I must have a thyroid problem,” they’ll say, “because no matter what I do, I just can’t lose weight.” Most of the time, that’s simply not true, but it’s easier to blame the thyroid than to blame their own lifestyle choices. Although it is very rarely mentioned, your thyroid and your reproductive cycle are closely related. Thyroid problems can cause irregularities in the menstrual cycle and even infertility in extreme cases. As you get older, these problems can become exacerbated. In fact, untreated hypothyroidism can cause a woman to be in an artificial premature perimenapause or even throw her into menopause. It’s important to remember that the thyroid is part of the overall endocrine system, and when any of this system’s hormones get out of balance, all of the parts suffer. So when you go through times where hormonal imbalance is more than likely—such as pregnancy, perimenopause, and menopause—your thyroid is also more than likely to get out of whack. That is why women over 50 should be tested for thyroid problems every few years (earlier if you have a family history) and women over 65 should be tested annually. Any woman of any age should be tested at any time and as frequently as needed if she has symptoms of hypothyroidism. Your doctor will then be able to determine whether you need thyroid hormone medication, and/ or iodine or other supplementation. In dealing with thyroid problems, it’s important to find a doctor who will listen to your symptoms and be open to the newest research, the latest reference range recommendations, inclusive testing, and who understands that each patient will react differently to various treatments. You may need to see an endocrinologist to get the results you need and deserve. It makes me frustrated to know that there are so many women who suffer unnecessarily for so many years. I hear it over and over again, how finally being diagnosed and treated for thyroid problems has changed women’s lives. They have accepted their “lot in life” for so long that they have almost forgotten what it’s like to have energy and focus and fun in their lives. I’m here to tell you, don’t just accept it. Get tested. Check your results. Ask for a copy of your labs. See a specialist. Don’t settle—if you don’t agree with your doctor, go somewhere else. You know your body better than anyone else. Listen to it, and get your life and your health back in your hands. Remember, thyroid disease is not just about fatigue, it can ultimately affect your morbidity as well as your mortality. Take control, but do it with the assistance of an expert. I have actually suffered for years with an underactive thyroid and it was never discovered until I lost part of my vision (temporary only thank God). What happens with thyroid testing in this Country is that Doctors follow the figures within a certain range and qualify as all being okay because the figures are within that range whether they are at the top or the bottom of the range and this is what happened to me. I actually believed that my anxiety over the years was because I was declining mentally, that my panic attacks were caused by a mental disorder, that the weight gain was because of stress and overeating. What happened, is that it was declared by my doctor that I have an underactive thyroid gland and when I look back at results taken years ago I always fell at the bottom of the range so declared “normal” then. I feel I have lost part of my life over it including the disruption of life through panic etc. Anyway, because it has been left for so long I am taking longer to recover (2 years so far) and I still need a shift in dosage. Make sure you read the tyroidUK site for more information. Thank you Susan for sharing your experience on this-I have to say that when I read Eva’s book I could recognise so many of my own symptoms- I am booking a thyroid test for myself. I am so pleased Eva was happy for me to share just part of her book so that others can have the information they need to make informed decisions to investigate their own health. So pleased to her that you are on the road to recovery! I was diagnosed with under active thyroid two years and have been tested every six months with the same results “outside the normal range but not serious enough to be treated”. I recently had a test taken at the gym I attend and was told my metabolism was that of a 74 year old woman – I am 59!! I have now started a course of reflexology to try and stimulate the pituary gland. I am half way through and finding I have more energy in the mornings. I am getting out of bed when the alarm goes off and doing chores – usually unheard of. I hope this may be of some use to other ladies. Thank you Glenna for sharing your experience,it seems that going untreated something quite simple can have sucha negative impact on quality of life. Susan who commented also was only just outside ‘normal’ but it wasn’t normal for her. Hopefully we can create more awareness to help more women get the help they need. How timely! I went to my doctor only this morning thinking that I should change my HRT. It wasn’t giving me the relief of the symptoms I thought it would (tired al the time, putting on weight, feeling down, lack of libido) . The first thing she did was suggest a blood test and test my thyroid. So we’ll see what comes up but I’m pleased I made the effort to go and see her rather than my usual (male) doctor. What a coincidence! I’m arranging to get my thyroid checked too as I am constantly tired and some days just struggle toget going at all.My energy levels are not what they used to be at all. The fatigue may also be due to thyrotoxicosis, in which case a prescription for radio-iodine may be of use, but as always, always down to your doctor. The phrase “It may be normal but it wasn’t normal for me” really rings bells. Why do we not have a benchmark reading say at 20 and at 30 when we should be functioning normally and then we could check against that with appropriate adjustments for age. This one size fits all reasoning clearly isn’t working. That is a very important symptom when someone who is normally high energy starts to exhibit exhaustion. Is unexplained hair loss also associated with hypo-active thyroid? Why would someone have their thyroid removed? Are you a Carer with Compassion Fatigue Syndrome?